Vigan is in Northern Luzon and the Spanish colonial influence in its local architecture and old-world charm make it a unique city in the Philippines. Best time to walk the cobbled streets is probably in the 90 minutes before dawn when the poisonous fug from two stroke engines has subsided and you can appreciate its remarkable state of preservation without being deafened and jostled. 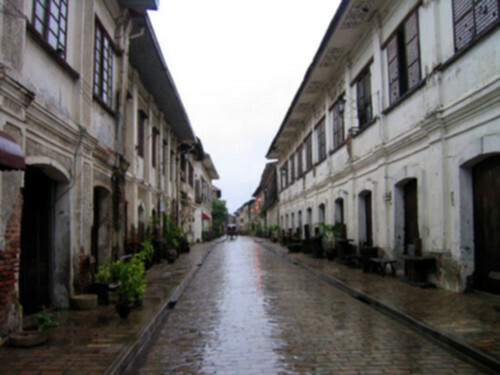 In pre-colonial times, Vigan was an important trading post for Chinese junks, trading gold, beeswax, and other products from the central Cordilleras for exotic Asian goods. Many Chinese traders settled in the mestizo district, marrying locals and starting new bloodlines. Vigan was captured and settled by the Spanish in 1572, and grew to become a centre of Spanish political and religious power in the north of Luzon. In 1758 Vigan became the Seat of the Diocese of Nueva Segovia. Interestingly the town was also a hotbed of anti-Spanish politics. Diego Silang was perhaps the most notable resistance leader, but was assassinated by his friends (on commission from the Spanish) in May 1763. Undeterred, Silang's wife, Maria Josefa Gabriela Silang, assumed leadership of the uprising but was later captured by the Spanish and publicly hanged in on September 20, 1763. Local legend has it that Vigan got its name from a simple communication breakdown. A Spaniard walking along the Metizo River apparently met a local and asked which the city's name. Not understanding what he was being asked, but seeing that the Spaniard seemed to be pointing to a tree, replied "Bigaa Apo" (a giant Taro plant that was common in the area). It is from the word "Bigaa" that Vigan is said to have derived its name. 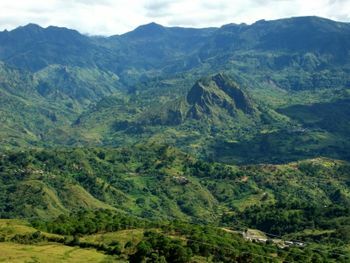 From Manila: It's seven to ten hours' drive along the scenic Ilocos Highway from Manila to Vigan. Partas Bus Co., Dominion Bus Lines, Viron Transit, and St. Joseph/Aniceto Transit have regular trips to Vigan. Bus lines like Philippine Rabbit Bus Line, Farinas Transit, Maria de Leon, Florida, and RCJ Transit have regular trips plying the Manila-Laoag route, which passes by Vigan. From the Mountain Province (Bontoc, Sagada) and Ifugao (Banaue): After reaching Bontoc from Sagada or Banaue, take a minivan or jeepney (say the 7:30 am) to Bontoc (₱50, 1 hour) and from there take a minivan (say the 9:30 am) to Cervantes (₱50, 1 hour) where you can catch a minivan (say the 2 pm departure) over the Bessang Pass to Bitalag (₱150, 2 hours), which is a few kilometres north of Tagudin on the llocos highway. From here you can catch a Partas or Dominion bus north to Vigan (₱179, 2 hours) or south to San Fernando (La Union). Interisland Airlines  flies to Mindoro Airport , also known as Vigan Airport, the airport serving the general area of Vigan City. Alternately, you could go to Laoag's airport (1.5 hours by car), the Laoag International Airport. Cebu Pacific and Philippine Airlines fly daily from Manila to Laoag. A fun throwback to colonial days are the calesa horse-drawn carriages that still clip-clop through Vigan's streets. Rates for calesa rides should be the same as those for the many tricycles (₱15 for 1 person (as of 2018) within the city limits) that will undoubtedly by vying for your custom. But you could also hire a private calesa for around ₱150 per hour. Unless you're absolutely sure you have a tour guide that will give you in depth information about the sites you're visiting, a whole day calesa adventure for about ₱1000 (roughly 6-7 hours) would be advisable. You can take your time visiting the sites and not being rushed by a guide, as well as picking and choosing the areas you want to visit. Warning! Be careful when chosing calesa. Some of the horses are in horrible condition - let's not make them suffer!! St. Paul's Metropolitan Cathedral (admission free) was built by Augustinians around 1790 and features a unique design intended to minimize earthquake damage; a style that came to be known as "earthquake baroque". Look out for the brass communion handrails forged in China, complete with Chinese characters scrawled by its ancient installers (if you look closely). The eight-sided bell tower is just south of the cathedral. Its position was actually the safety measure of the earthquake baroque style: it was built separately from the church so that it would not topple into the church in the event of an earthquake. Its eight-sided design reflects its Chinese Feng-shui influences. One would look closely inside the cathedral and one would find the tombstone of the great Ilocano poet Leona Florentino (in the column near the entrance facing Plaza Burgos). Just adjacent to the Cathedral is the Archbishop's Residence, which dates back to the Spanish Era--the oldest archbishop's residence still in use in the Philippines. Just below the Archbishop's Residence is Govantes Dike, which was once a docking place for watercraft. Nowadays it is a boating lagoon. Plaza Salcedo west of the cathedral features a 17th Century monument to Juan de Salcedo, and was also the site of resistance leader Gabriela Silang's public hanging in 1763. Plaza Burgos is a favourite hang out for locals. It is also used for staging major public events. It has also food stalls selling native snacks, notably the empanada, a turnover with Spanish origins; and the sinanglao, which is a beef hotpot made with beef offals. The Philippine National Museum - Vigan is composed of what used to be the home of Father Jose Burgos and the former Ilocos Sur Provincial Jail, where the Philippines' first Ilocano president, the late Pres. Elpidio Quirino, was born. It houses Ilocano artifacts, weapons, kitchen utensils, basketry, costumes, jewellery and Burgos Memorabilia. There are also some dioramas showing important events in the history of Ilocos Sur, and a mini library. The Syquia Mansion used to be the Vigan residence of President Elpidio Quirino. There are memorabilia inside the residence, which includes a campaign portrait of Quirino. Baluarte is a mini-zoo in Salindeg, a barangay of Vigan. Watch the nightly water fountain show at Plaza Salcedo (depending on the weather). Visit Baluarte, the governor's fortress. It also features a mini zoo with exotic animals and you can get a free ride with the small horses. This is not recommended for western people due to the poor living conditions of the animals. There is also an African Gallery which features stuffed animals that have been shot by the governor, including an elephant, along with pictures of the governor with the killed animal. Try your hand at pottery. 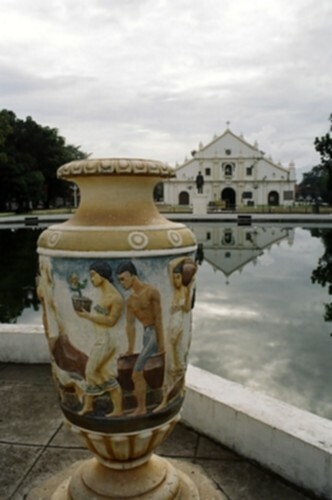 Vigan's Pagburnayan makes burnay jars which are made of clay kneaded by carabao and fire-blasted in a huge kiln. Ride a kalesa, a horse-drawn carriage, around Vigan and the surrounding towns. Join the Kannawidan, Viva Vigan-Binatbatan, Semana Santa (Holy Week), and Raniag Festivals when it happens. The Kannawidan festival happens right after the City Fiesta (around the last week of January to the first week of February); the Viva Vigan-Binatbatan festival of the Arts is held in May; and the Raniag festival happens during the week of Halloween. Boating at the Govantes Dike. You can skateboard with the locals in the afternoon at Plaza Burgos. There are dozens of antique and souvenir shops dotted about the city, particularly on Crisologo and Plaridel Streets in the mestizo district. Although some of the antiques are only reproductions, you'll still enjoy browsing odd items, religious paraphernalia (look out for the toddler Jesus figurines) and some unique foods. You can also buy hand-rolled cigars, sold in packs of three. You can also go to the San Ildefonso area and buy Basi (Sugarcane Wine) or Duhat Wine. Nobody should leave Vigan without tasting their empanada. It is a different concoction from the flour-based empanada that one usually knows. Royal Bibingka is very popular at Tongson's Royal Bibingka, #8 Florentino St., Vigan City--just across the street from Plaza Burgos. Also, one should have a try of the Vigan longganisa which is spicy unlike its Pampanga counterpart which is sweetish. There is also a delicacy called tinubong, a sticky sweet rice cake that's sold in bamboo tubes, and you have to break the bamboo (you can smash it against a concrete wall or use a knife to split it) to eat the sticky sweet rice inside. (Caution: split bamboo is sharp at the edges.) They are usually sold in the Heritage Village in bundles of three to five. Fried tasty corn (cornick) can also be bought in the various stalls. It comes plain or flavoured. Native sugar is also made in surrounding towns and barangays of Vigan. However, they are in the form of tagapulot (molasses) and balikutsa (a hard gray-colored sugar concoction shaped into scrolls). Try the Basi, a local "wine" (native rum) made from sugarcane. If you're looking for cheap accommodation in Vigan, there are plenty of transient rooms on Liberation Blvd. The cheapest ones (₱300 per person as of Nov 2017) are past the river (San Julian Sur neighbourhood). Casa Rica Hotel, 88 Quirino Blvd cnr Calle Abaya, ☎ +63 77 674-0591 ([email protected])" Opened in 2013. Cordillera Inn, Crisologo St., (077)-722-2727. Gordion Hotel, V. delos Reyes corner Salcedo Sts, Vigan City, . checkin: 1:00PM; checkout: 12:00 NN. Strategically located infront of Vigan Convention Center edit A hotel set in and around an ancestral home. It is the only twin ancestral house with a courtyard and romantic ruins, where old touches like furnishings and memorabilia from another era perfectly complement the comfortable modern day amenities for sleeping or unwinding. Tour Packages available. Affiliated with Gordion Travel and Tours. Grandpa's Inn, 1 Bonifacio St cnr Quirino Blvd ☎ +63 77 722-2118, fax: +63 77 722-1446; ([email protected]) From ₱2500 en suite, air-con, cable TV and Wi-Fi. (Feb 2015)) Charming old residence and also one of the cheapest options in town. The downstairs restaurant serves good food (from ₱60) and even espresso (₱40). R.F. Anicieto Mansion Hotel, near Plaza Burgos, (077)-722-2383/fax: 722-2384. Socio-Pastoral Center, besides the Archbishop Palace - go through the main gate and ask. It is literally inside the palace on the courtyard. You can't beat the location nor the price. It's simple, but clean. You get a bed for 300 pesos a night (06/2017). Rooms have two beds a fan and a small table. That's all. Common showers. Nice staff. Recommended. (077)-722-1442. Hotel Luna - along V. delos Reyes St. It has a museum inside the premises. 1. Head north to Loaog and Pagudpud. Take an early bus from Vigan south (2 hours, ₱179) towards San Fernando (La Union) and tell the driver you want to get off at Bitalag (₱150), which is a few kilometres north of Tagudin. As you approach Bitalag you will seen a road sign for a turnoff to Bessang Pass. Take a minivan from Bitalag to Cervantes (₱150, 2 hours). These first start departing between 7 to 8 am The minivans run roughly every three hours until 5 pm, but this strongly depends on the number of people travelling. The minivans are located on the other side of the T-junction beside the New Crossing hardware shop. There are public restrooms at Bitalag. The route takes you on a winding picturesque road (subject to landslides) through the Bessang Pass National Park. From Cervantes take a minivan or jeepney (which passes over the Alulung Bridge which opened in March 2013, 35 years after construction commenced) either direct to Bontoc or there is no direct service then to Bauko (₱70, 1 hour) and then another from there to Bontoc (₱50, 1 hour). Another route between Cervantes and Bontoc is via Abatan, but this is longer. If you are going onto Sagada, ask the driver as you approach Bontoc to let you off at the turn-off to Sagada and flag down a Sagada bound jeepney. This avoids going all the way into Bontoc. You can easily make this trip in a day and you arrive before sunset in Sagada. The other alternative is to overnight in Cervantes where there are a couple of accommodation options.